The United States has two separate banking systems today—one serving the well-to-do and another exploiting everyone else. 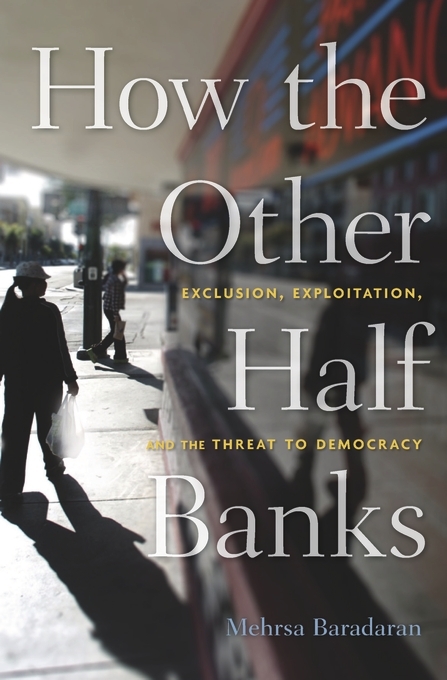 How the Other Half Banks contributes to the growing conversation on American inequality by highlighting one of its prime causes: unequal credit. Mehrsa Baradaran examines how a significant portion of the population, deserted by banks, is forced to wander through a Wild West of payday lenders and check-cashing services to cover emergency expenses and pay for necessities—all thanks to deregulation that began in the 1970s and continues decades later. In an age of corporate megabanks with trillions of dollars in assets, it is easy to forget that America’s banking system was originally created as a public service. Banks have always relied on credit from the federal government, provided on favorable terms so that they could issue low-interest loans. But as banks grew in size and political influence, they shed their social contract with the American people, demanding to be treated as a private industry free from any public-serving responsibility. They abandoned less profitable, low-income customers in favor of wealthier clients and high-yield investments. Fringe lenders stepped in to fill the void. This two-tier banking system has become even more unequal since the 2008 financial crisis. Baradaran proposes a solution: reenlisting the U.S. Post Office in its historic function of providing bank services. The post office played an important but largely forgotten role in the creation of American democracy, and it could be deployed again to level the field of financial opportunity.